It’s nice to see different kinds of ground meats at the markets today. I just made a wonderful free form ground lamb puff pasty tart and now that I spied ground veal at Atkinsons’ I thought that I would do something with that. This is an easy recipe with some variations for you to choose that will make the end result zing in different ways and is pretty enough to serve for company. For the meatballs, combine the ground veal with 1 finely chopped mushroom, 1 diced garlic clove, 1 Tblsp. grated Parmesan, 1 Tblsp. diced onion, 1 Tblsp. chopped parsley, the sage (or pinch of nutmeg) and the well beaten egg. Mix well with your hands and then add 1/2 C. (or more if you feel necessary) breadcrumbs. Form the ground veal into 1” diameter meatballs. 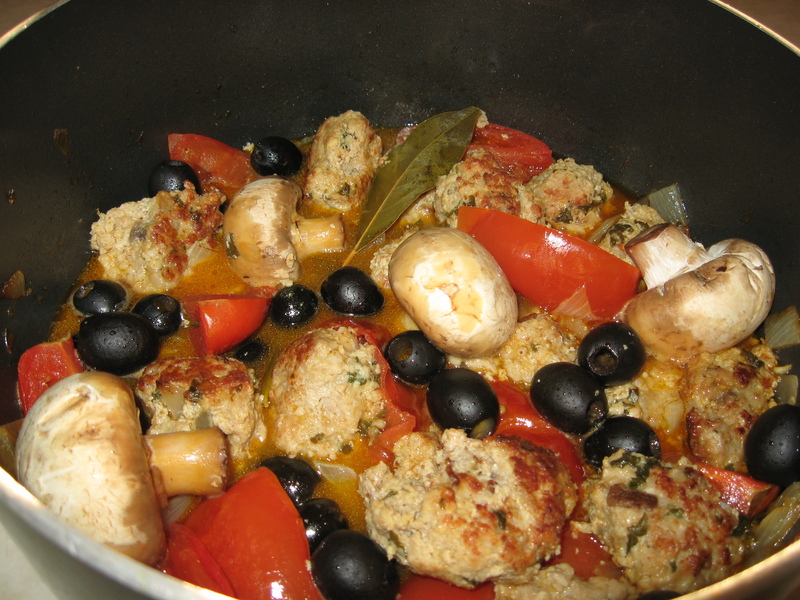 In a large pot, heat the olive oil/butter and then gently place in the meatballs. Turn them gently with a fork or tongs till they are nicely browned (about 5 minutes). Remove them to a plate. In the same pot you should have enough oil and juice to brown the remaining onion. Stir the onion till softened (5 to 10 minutes) and then add the remaining garlic and cook one minute more. Add the S&P and the wine; if you would care for more liquid you can add 1/2 C. or more chicken broth. Let come to a slow simmer and add the tomatoes, 2 Tblsp. chopped parsley, bay leaf, turmeric and rosemary or thyme. Stir gently and then add the meatballs. Turn the heat to very low, cover and cook, stirring very gently every now and then for about 45 minutes. Add the whole mushrooms and black olives at the very end; continue simmering with a cover on till the mushrooms are tender and done (about 5-10 minutes). I like this stew served on top of fluffy white rice and a green salad for a side. Crusty French bread is always a nice addition. When flavoring roasted vegetables (particularly after roasting) you want to avoid a heavy dose of liquids because they’ll soften any crisp edges that develop during roasting. Roast in a very hot oven—Anywhere from 425 to 475 degrees is usually perfect. It really depends on your oven and your taste. I don’t mind veggies that are blackened somewhat; maybe for you that’s too much. So, I guess I’d try 450 degrees to start with. 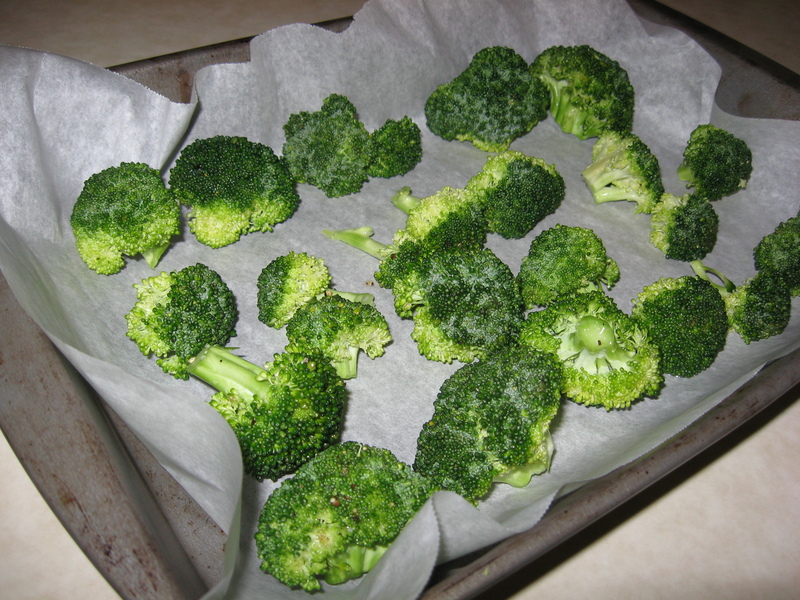 Cut your vegetables in even-sized pieces so that they’ll roast evenly. Except for potatoes, you can cut up the veggies the morning of your planning to roast them. To prevent sticking, line a heavy duty high edged pan with parchment paper. Place your vegetables evenly over the whole pan—and in fact near the edges of the pan particularly if your pan is sparsely populated. Vegetables near the edges tend to brown better. Place rack in center of oven and heat to 425-475 degrees. 2. Line baking sheet with parchment paper. Wash, air dry and prepare vegetables according to the “quick guide introductory paragraph” at start of this column and the “vegetables to use” guide found below. 3. In a bowl toss your vegetables with the “master recipe” ingredients. Do not clean bowl because you’ll be using it again after the veggies are done. Place your vegetables evenly spaced on your lined pan-lying–on the cut side if that’s applicable. Roast according to individual vegetables mentioned below in “vegetables to use guide”. Watch carefully to see that your veggies don’t brown more than you wish them to—but remember, they shouldn’t be under roasted. ( OR use another flavoring which will be mentioned in my subsequent column next week). Sweet potatoes: 3-4 servings per lb. Cut into 1-inch pieces. Roast 10 minutes and flip and roast 5 to 10 minutes more. Cauliflower: 3-4 servings per lb. Cut into 1 to 1 ½ inch florets. Stir every 10 minutes until tender and light brown—20 to 25 minutes total. 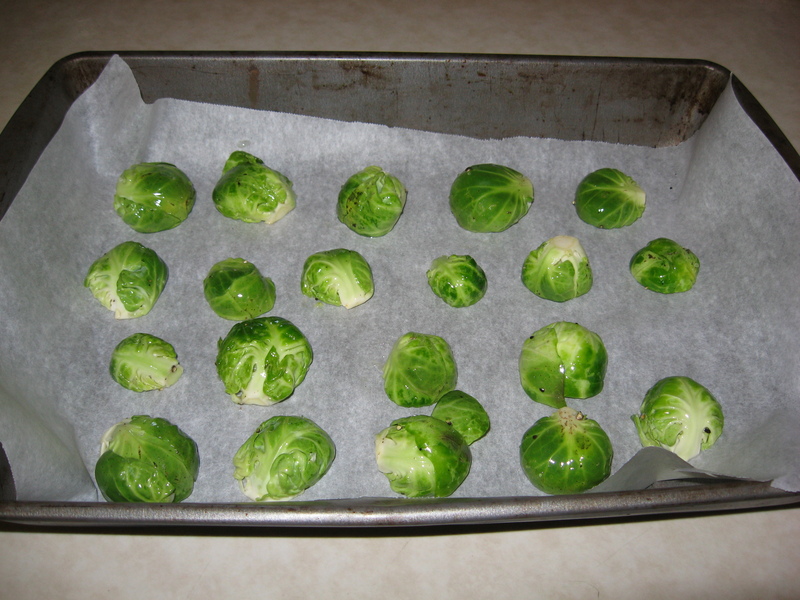 Brussels Sprouts—3-4 servings per lb: half lengthwise; arrange cut side down and roast until tender and brown—about 15 minutes. No need to flip. Potatoes (red, yellow, russet) 2 -3 servings per lb. Peel or scrub clean and dry. Cut into 1 inch wedges. Roast until brown on bottom-10 to 15 minutes. Flip and continue to roast until tender—5 minutes more. Carrots: 3-4 servings per lb. Peel, if thick cut in half crosswise to separate thick end from thin end; half the thick end length wise. Cut crosswise into 1-inch lengths. Roast until lightly browned on bottom, 12-15 minutes. Flip and roast until tender—3 to 5 minutes more. Shriveled can be OK. Beets: 4 servings per lb. Trim, peel and cut into 3/4-1 inch wedges. Roast 15 minutes, flip and roast until tender-10-15 minutes more. Parsnips– 2-3 servings per lb. Peel, halve crosswise, halve or quarter thick end lengthwise and cut all crosswise into 2-inch lengths. Roast until browned on bottom about 10 min. Flip and roast till tender-about 5 minutes more. Green beans: 4 servings per lb. Trim stem ends. Roast until tender, a bit shriveled, and slightly browned, about 15 minutes. No need to flip. Mushrooms: (cremini or small white) 3-4 servings per lb. Brush clean and trim stems flush with cap. Roast stem side down until brown on bottom 20-25 minutes. Flip and roast until browned on top- 5 to 10 minutes more. 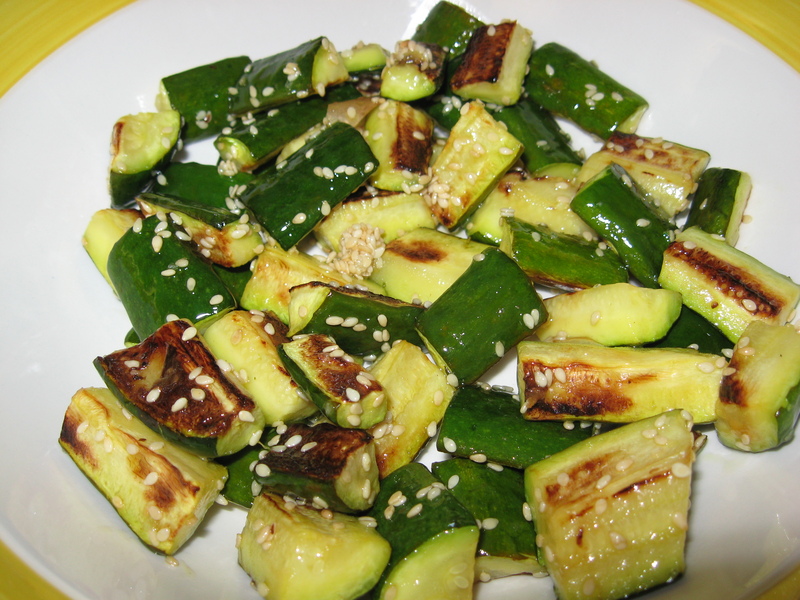 Zucchinis Wash well, cut off ends. Cut lengthwise to create 4 halves and then crosswise in even 1/2 to 3/4 inch chunks. Roast open side down till brown, about 9 minutes. No need to flip. Roasting a medley: If you insist, because they do cook at different rates, this will be more time consuming and intensive caretaking, so try to roast veggies that have approximately the same cooking times; or cook them all individually and then put them together. Veggies I have left out because of print space limitations: Fennel (15 min. flip 10 min. more); Turnips (10-15 min., flip, 5 more min. ); Rutabaga–15 min. flip and 10-15 min. more. NEXT WEEK—Six Yummy Splashes To Use With Your Roasted Veggies. 1 Tsp. chopped fresh thyme. Combine in a small saucepan lemon zest and oil. Cook over medium-low until zest bubbles steadily for about 30 seconds. Remove from heat, let cool about 3 minutes and stir in the herbs. Let sit for at least 20 minutes. Toss with the vegetables and S&P before roasting. With this splash you don’t need to use the master recipe. Discard lemon zest when veggies are put on baking sheet. 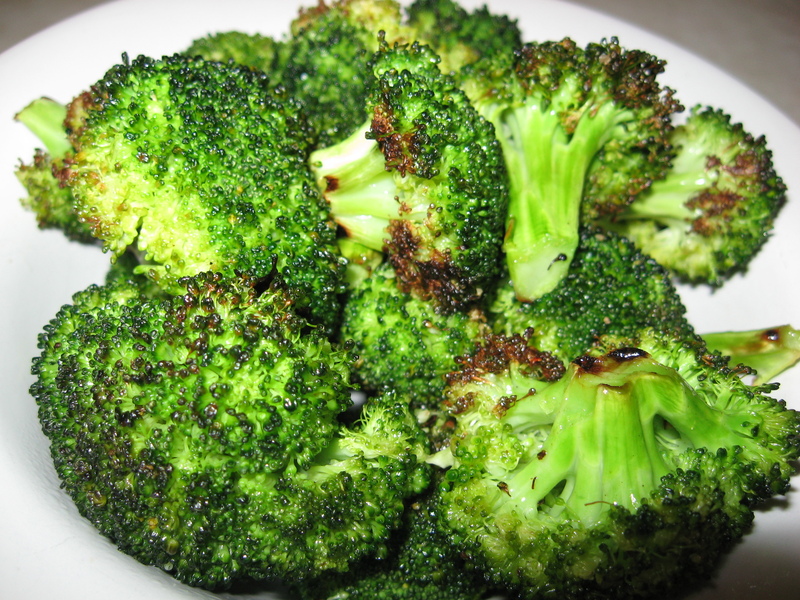 If necessary, add additional oil after veggies have roasted. Pair with beets, butternut squash, carrots, cauliflower, fennel, mushrooms,zucchini, parsnips, potatoes and sweet potatoes. olive oil from the master recipe to the veggies, toss 1 Tsp. of these spices with your veggies. After veggies are done, douse them with this rub and if you wish, more olive oil as well. . Pair with butternut squash, carrots, cauliflower, parsnips, potatoes, sweet potatoes. you should still see some whole seeds in the mixture. Roast your veggies using the master recipe. roasted which seems to be very tasty as well. I really use this easy splash a lot. The lemon zest. Stir to blend well. Season to taste with S&P. toss about 1/3 of the butter (generous tablespoons) with the veggies. mushroom, parsnips, potatoes, and sweet potatoes. toss them with this splash. In a medium mixing bowl, combine the first 7 ingredients and then add the ground turkey. Mix well and make small sized meatballs (1 inch circumference more or less). In a large skillet sprayed with non-stick spray, brown the meatballs over medium heat (about 8-10 minutes) turning them until evenly browned (I turned them with two tablespoons) and done. They will be a bit dark on the outside which is just fine. Set them aside for the moment. 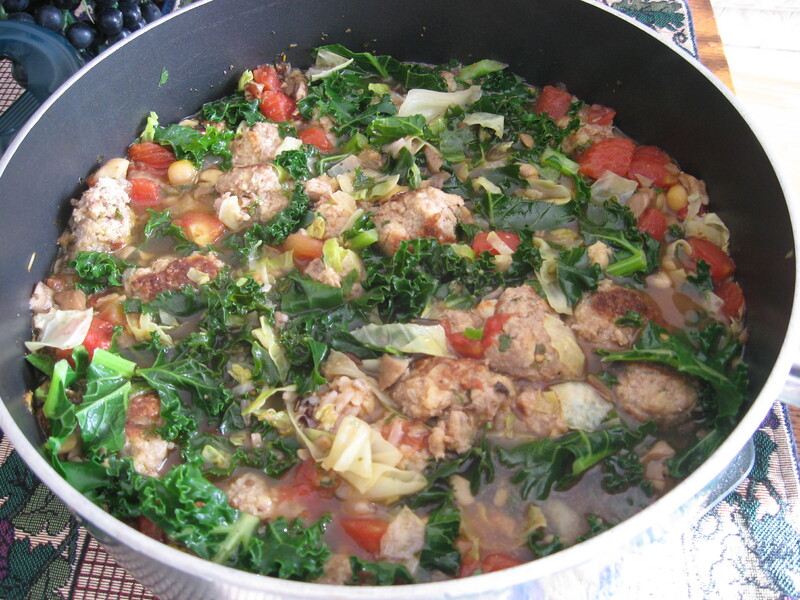 In a large pot, stir together the next 7 ingredients and then add the meatballs. Then place the pot over medium high heat till the mixture comes to a low boil. Simmer covered for about 15 minutes. For the last step, add the vegetables, bring to another boil, reduce to a simmer and cook till the vegetables are tender. Serve in bowls with some shaved parmesan or Romano on top along with some crusty bread or nice bread sticks. Here’s an additional wonderful thing to keep in your freezer and have on hand for whenever. It’s great to put in soups, stews, omelets, etc. Stir in the mushrooms. Cook, stirring until they have given up most of the liquid, about 10 minutes. Turn the heat to low and continue to cook stirring until almost all the liquid has evaporated. Season well, then stir in the parsley. Use immediately or refrigerate (1 week) or freeze. Put in blender and process. Refrigerate and serve cold. Garnish with lime wedges, sour cream (or yogurt), sliced green onion and chopped tomatoes. Place butter/oil in large deep skillet and turn heat to medium. As the foam begins to subside, stir in the shallots (whatever). Cook, stirring occasionally, until they soften—3 to 5 min. Stir in the mushrooms. Cook, stirring until they have given up most of their liquid, about 10 min. Turn the heat to low and continue to cook, stirring, until almost all the liquid has evaporated. Season well, and then stir in parsley. Use immediately or refrigerate or freeze.